Mr Antonello Madonna, CEO, Telsey S.p.A. speaks to Adam Baddeley about progress in extending broadband services tailored to provider and consumer needs. Q: What advantages are there for providers in working with Telsey? A: I think that we can summarize these into three main points. First is our experience in the area of modernisation of access networks, pioneering the technological area of broadband access starting from 1999. Today we have the largest installation of broadband access Internet devices to the home, fibre to the home and DSL. We are the supplier of FastWeb in Italy and we are the largest operator in the world of full network work access through IP networks. FastWeb is going to have around 300,000 installations by the end of this year and they are all through fibre and DSL using fully IP networks. FastWeb is the largest triple player in terms of installation worldwide – delivering video, voice and data over IP. Secondly, over the four years from when we started in 1999 we have been addressing modernisation of the access networks. Our extensive experience in the installed base is the major reason providers have selected Telsey. We also have a complete portfolio: access gateway products, IP video stations ranging from IP set boxes for IPTV up to video telephony over a low bit rate connection while maintaining high quality. 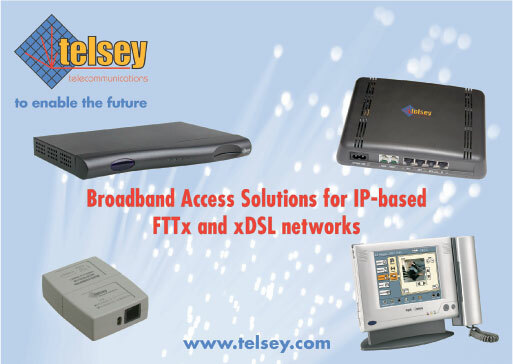 Telsey can offer solutions that support the broadband service provider through their life cycle from initial installation and deployment of access gateways up to the delivery of video services. Finally, it is our partnership and interoperability with major network equipment providers and systems providers that represents a third crucial point because interoperability is the key element in next generation networks. There will certainly be an implementation of a fully IP network, simplification in terms of the architecture and a reduction in the costs of both the overall network and its management. The complexity will be higher and understanding issues of interoperability and Internet working will be paramount in making that network deliver services and profit. We have long experience in doing just that. The point is what we do to keep ahead of the competition. Q: How do you keep ahead in terms of understanding the needs of customers? A: I think there are two key elements. Our customer centric approach puts the customer at the centre of all the activities we undertake. We try to move in the same direction as our customers in terms of strategic decisions so that customer intimacy will give us an understanding of their business plan and their objective of business returns. The second point is that we use total innovation so that we look at each of the business problems of our customers in terms of how we can contribute with innovative solutions. Our contribution maximizes the use of cutting edge technology, ranging from the latest silicon or the soft platforms available, as well as innovation in the processes we are using to support them and to consult them in how to deploy a network. We are always looking for an innovation approach. All our products, for example, have a vintage chart – indicating the revenue for the year’s business plan, segmented by the age of the products. If you look at our vintage charts for the last couple of years and the next three, you will see that there is no one product that lasts more than 24-36 months. Every three years we completely renew the product line. Q: Does that distinguish you from your competitors? A: If you mix completeness of the product portfolio together with an approach that by the time we launch a product we are always designing a new version, it keeps us ahead of the competition. In terms of how we operate in the market we have a good balance between product portfolio and customer portfolio. We dedicate 50% of our activities to product development and 50% of our Research & Development activities to customisation to the needs of our customers. We believe this is a key advantage and a key element at least for the next 3-5 years. A next generation network, based on IP, is still in its infancy and each of the operators need to have their peculiarities and customisation as they implement services on their network, depending on their geographic distribution, customer profile and so on. We will provide a service where we have the products but at the same time we have the capability and the competence to customize those products mainly in terms of software and software applications with their specific business model. Q: How do you see the market developing? A: We distinguish between technology and applications. In the area of applications we increasingly see the expanding need for two-way interactive services. These include real- time video applications that could be used for IPTV, video on demand and video telephony, and the expansion of applications like IP Virtual Private Networks for secure communication in the business area. We also see the growing deployment of what we call broadband enabled applications. These applications already exist in the form of home automation, for example, but are being extended by the concept of broadband services. These include two-way interactive remote control in the area of robotic services or e-learning and we see major development in the future using IP convergence of the different services. In terms of technology there are again two basic elements. The first is the adoption of DSL technology, particularly by large service providers. These providers will seek to redress the loss of revenue from traditional telephony through their involvement in broadband services. At the same time the provision of fibre technology will continue but will be a minority aspect of DSL technology, as DSL will allow the reuse of assets by large operators. It will also allow the new operators to reach more customers in all geographic areas. The other direction of the technology will be wireless access in the residential environment, which will enable the deployment of broadband without the need for new cabling in the house. Q: What is the regional focus for the company? A: We are focusing on Western and Eastern Europe and the Middle East. We believe that Europe is leading the development of the next generation network IP and we are focusing on this and not on North America – which is dominated by the cable industry – as the approach they have for IP convergence is different from Europe. We believe that Europe will have massive deployment, ahead of North America, for broadband using fully IP networks. In order to do this we have consolidated our presence in several countries over the past two years, with multi-year contracts with the broadband operators from Spain, Norway, Switzerland, Germany and the Middle East. Q: Which areas within the Middle East are of particular importance? A: The Gulf States have several interesting projects and funding to deploy the latest technology based on IP, providing an integration of video, voice and data. As they can start from scratch in certain cases they are able to deploy the latest technologies. 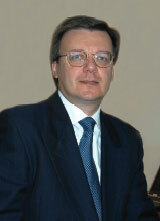 A: We have introduced, through Telecom Geneva, our latest product – WAVES (Web and Video Entertainment System). This is providing groundbreaking solutions for IP video services. It is really the integration in an IP video station of services such as IPTV, video on demand, pay for view, web browsing through the TV, video telephony with high quality imagery and supporting low bit rates like ADSL 256kbit. These applications (this new product can support both at the same time, Video Telephony and pay TV) are running on a platform that represents the highest level of flexibility in IP video stations today. Q: Where do you anticipate installing more advanced, next generation services? A: I think the first will be in Italy, as Fastweb is implemented and is rapidly growing. In the area of video telephony services, Telecom Italia recently announced their video telephony service and we have evidence that other major telecom operators, for example Deutsche Telecom, are also thinking about how to implement Video telephony through an IP network.